First time on the market! 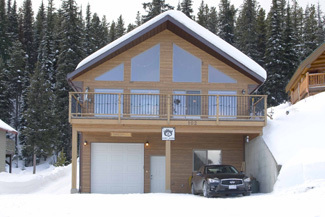 Built in 2004, this quality chalet is located in the Big Horn subdivision at Apex Mountain Resort. Situated in a quiet area with a great view of the hill and the surrounding mountains. Excellent use of space with two bedrooms and a den and two full bathrooms. Open concept living room, dining and kitchen with vaulted ceilings and an abundance of windows. Sliding door leads to the large stamped concrete deck looking out the top of the quad. Efficient wood insert with a thermostat and fan system design to heat both levels. Spacious master bedroom offers direct access to the back deck, concrete pad in place and wired for a hot tub. Covered BBQ area and wood storage in the backyard as well as a large garden shed. Fully fenced yard and gate opens up for vehicle access. Backyard could accommodate a detached garage. Back gate provides direct access to snowshoe trails leading right up to The Circle. A true mountain retreat! !